Welcome to Otter Bay Books! Are you a new author wondering where to start? Are you a past author wanting personal service for a change? 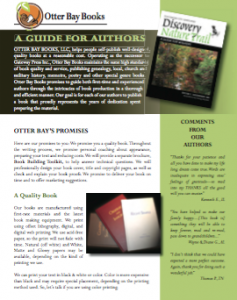 We will work with you to create a quality book that meets your needs. We know how important your book is to you. We are here to make suggestions that will give your book a more professional appearance. We are here to listen to your needs and to explain the printing process that will work best for you. We are here to professionally guide you through the production of your book, and we will also file the copyright in your name. After we manufacture a minimum of 50 physical books for you, we can also set up an E-book, if desired, for a small additional charge.